Following the appointment of a China-friendly coordinator to lead the Taiwanese delegation in November’s Asia Pacific leaders’ meeting, Taiwanese President Tsai Ing-wen formalized the offer to reestablish a dialogue with the People’s Republic in her National Day Address, on 10 October 2016. Tsai, however, received a cold reply from Beijing, where the “1992 consensus”, which defines both nations as one country, remains to be upheld as the cornerstone of cross-strait relationships. Official sources called the Taiwanese President’s offer for peace and understanding an “evil path”. Taiwan President Tsai Ing-wen on Monday urged China to engage in talks, pledging to maintain peace with the island's giant neighbor, amid a near five-month impasse after Beijing halted official communications with the self-ruled island. However, Tsai, in her first National Day speech, stopped short of conceding a crucial principle that Beijing has said is needed for talks to resume, that Taiwan is a part of China, also referred to between the two sides as the "1992 consensus". Tsai's proponents have said she has been holding out olive branches to China, but also choosing her words carefully so as not to lose her key anti-China support base at home. "The two sides of the Strait should sit down and talk as soon as possible," Tsai said in her address, referring to the Taiwan Strait that separates the island from the mainland. "Anything can be included for discussion, as long as it is conducive to the development of cross-Strait peace and the welfare of people on both sides," Tsai told foreign and domestic dignitaries in a speech broadcast live on television. But China's Taiwan Affairs Office said the "1992 consensus" remained the touchstone by which it would engage with Taiwan and judge Tsai. "Denying the '1992 consensus', inciting confrontation across the Taiwan Strait and severing socioeconomic and cultural ties is an impassable, evil path," it said. Tsai and her Democratic Progressive Party (DPP) took power in late May after a landslide election win over the incumbent Nationalist party. Beijing distrusts the DPP because it traditionally advocates independence for Taiwan, which China deems a wayward province to be taken back by force if necessary. Tsai said she would maintain a consistent, predictable and sustainable relationship with China. She reiterated that the relationship should be based on the "accumulated outcomes enabled by over 20 years of cross-Strait interactions and negotiations since 1992." "Our pledges will not change, and our goodwill will not change. But we will not bow to pressure, and we will of course not revert to the old path of confrontation," she said. The so-called "1992 consensus", which was agreed with a China-friendly Nationalist Government, acknowledges Taiwan and China are part of a single China, but allows both sides to interpret who is the ruler. 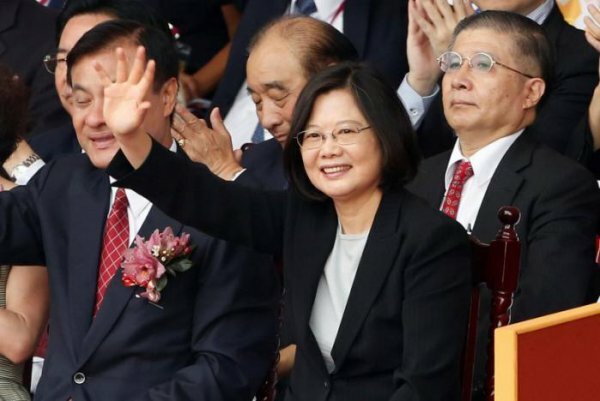 Last week, Tsai appointed a pro-China politician to be her envoy for a meeting of Asia-Pacific leaders next month.